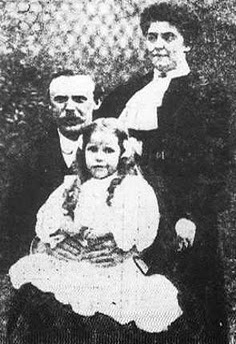 Nana Harper, the 6 year old daughter of Dr. John Harper, who was on his way to Chicago to preach at the Moody church will return to England without coming on to Chicago. She is in charge of Miss Jessie Leitch, who was rescued with her. The Rev. Ervine Wooley, assistant pastor of the Moody church, is with them at the Manhattan hotel in New York. A letter from Dr. Wooley to A. F. Gaylord, chairman of the executive committee of the Moody church, gives Miss Leitch's account of the night when Dr. Harper was lost. Dr. Wooley writes that Nana did not know her father was dead until she arrived in New York on the Carpathia. "Miss Leitch," he writes, "had only the clothes she wore, had saved no money or valuables, and little Nana, taken as she had been from her berth at midnight, had only her little nightgown and blanket wrapper, around which Miss Leitch had wrapped her own cloak. A woman standing by insisted on throwing a heavy ulster over Miss Leitch which she had brought to the pier for that purpose. They had no stateroom on the Carpathia and had stayed night and day in a corner of the library." "About midnight Mr. Harper came to our stateroom and told us that the vessel had struck an iceberg. While I was dressing he went to learn further particulars and returned to say that the order had been given to put on the life belts. We did so, and, pickung up Nana in his arms, he took her up to the deck. There the women were ordered to the upperdeck. I had to climb a vertical iron ladder and Mr. Harper brought Nana after me up the ladder and the men at the top lifted her up to me again. "There was no opportunity for farewell, and, in fact, even then we did not realize the danger, as we were assured again and again that the vessel could not sink, that the Olympic would be alongside at any minute, and that the women and children were to be put into the boats first and the men to follow, and that there were boats sufficient for all. Our boat was well manned--it was the eleventh to leave the vessel. "After about half an hour the Titanic went down. We were about a mile away."